While I initially thought Todd and Barrett’s enormous crush on Interim was a bit ridiculous, I’ve come to learn it’s totally appropriate. 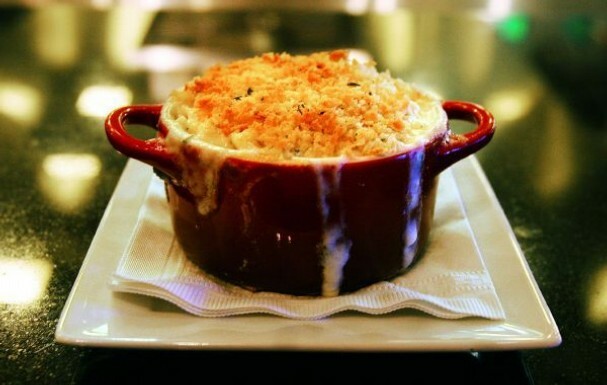 Their mac and cheese – along with pretty much everything else on the menu – is phenomenal. Thanks to The Commercial Appeal’s Jennifer Biggs for getting them to share the recipe here. If I made anything that tasted this good I would probably keep it a secret, but luckily Chef Jackson Kramer’s not a stingy hatemonger like I am, so yea for us! Bring a large pot of water to a boil and add a handful of salt. Add the pasta and cook until fully done. Do not worry about cooking it al dente. Cool under cold water and set aside. Béchamel: Make a roux by adding 2 oz. butter and 2 oz. flour to a pan and cook until thoroughly combined and light brown. Stir in half-gallon of milk and let simmer for 30 minutes. Season with salt and pepper. Dice the country ham and sauté in a pan for 1 minute. For the topping, melt the butter and add it to the panko bread crumbs with the Parmesan and herbs. To finish, combine the pasta, Béchamel, and cheese blend in a large pot. Warm over medium heat until the cheese has totally melted. (if too thick, add a touch of water). Add the thyme and country ham. Season with salt and pepper. Add it to a small casserole dish and sprinkle the bread crumb topping on top. Place in the oven and bake until top is golden brown. ** The cheese blend consists of 1 part Parmesan, 2 parts white cheddar and 2 parts fontina. Makes about 6 casserole servings.